Hey everyone! Myself, Allie of Brit Nails, and Hannah of Polly Polish have been talking on WhatsApp for what feels like my whole blogging life, but has really been around 2 years. I can't imagine blogging without them to be honest, and they've helped me through a lot, not just nails. So we decided that it was finally time to pay homage to each other by creating each others designs. This will consist of two different posts, one with Allie's design and one with Hannah's. Today I'm recreating one of Allie's designs. I chose this vibrant Valentine's design because it fits well with the time of year, and also because I owned the Picture Polish shade she used (baring it mind I only own 4). You can see her original post here, and you can see a picture below of her design to compare. Her nails are of course a lot longer than mine so it was never going to look as elegant, nor do I own any square studs apparently. I also don't own any stencils so I had to completely freehand the design. This meant that I didn't create the gradient with a sponge, but instead with a brush for the first time, and it isn't as fluid as it would be with a sponge. However, I was pretty happy with the final result, and I think it's very bright and fun, and I hope you can still see the similarities between the two designs! I started with the Barry M - Iron Mani Nail Hardener* base coat. The base of my ring finger is Barry M - Cotton for the base of my ring finger, then I used Picture Polish - Sizzle for the pink, and Barry M - Need For Speed for the purple. The studs are from Avon. I finished off with a coat of Seche Vite. You can see Allie's recreation of Hannah's design here, and Hannah's recreation of my design here. Check back on Monday for my recreation of Hannah's nails! Love your guts! And your nail art. I still remember loving this design when Allie first posted it! Your recreation is so spot on, love it! Can't wait to see you do one of Han's!!! This is a super cute design! I love seeing it on two different nail lengths/shapes! The gradient heart is SO cute! These are so cute Alice! And it's great that the three of you are recreating each other's designs :) great job at free handing the heart, it looks beautiful!! I totally remember when Allie did these nails! I wanted to recreate them then and now you're making me want to all over again. You did a perfect job! Too cute! 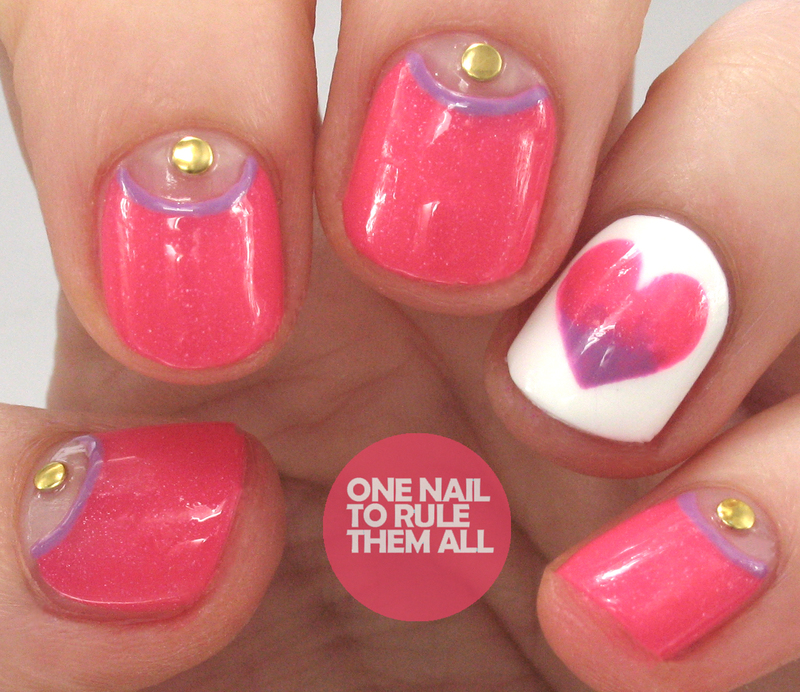 Those hearts are my favorite part but really the entire mani is awesome! Oooooh that is such an adorable look! Love the half moons and the heart and everything!